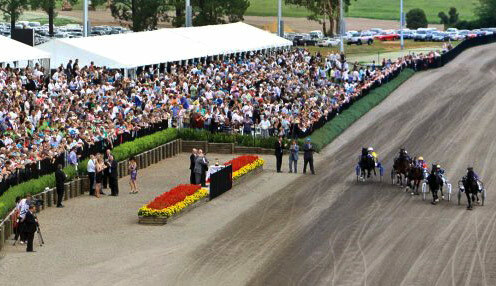 Max Delight will return home on Sunday night with the aim of winning the Tasmania Derby in Hobart. The youngster is trained by David Aiken in Victoria, but is owned on the Apple Isle by Michael Maxfield, and the locals will be keen to claim Max Delight as one of their own. The Blue Riband is part of a sensational card which includes the Pacing Cup, Trotters' Cup and Oaks. "Michael wanted him to come down to try and win the local Derby," Aiken said. "He will head over on the boat this arvo and get there in the morning. "With Menangle on Friday night this week Todd McCarthy will make the trip down to drive him." McCarthy combined with Max Delight to capture the New South Wales Derby at Tabcorp Park Menangle a fortnight ago and looks to be the one to beat this time around as well after drawing to lead throughout from barrier two. "He came through his Sydney runs in great shape," Aiken said. "I gave him a couple of light days after that and he has been working up nicely since. He's drawn well and will be pretty hard to beat." After Sunday's assignment, the colt is poised to return to the scene of his Group One triumph later in the season. "He will have a little freshen up after the Derby," Aiken said. "He is New South Wales-bred so the Breeders' Challenge in June will be his next main target. I'll see what I can find in between as a lead-up to that series."